This article is version 0.27. The 0.27 version added some features to the 0.25 version and bug fixes. Version 0.27 is planned to be changed to Version 1.0 only with no further function. I think most of the essential functions of the HF radio I think have been implemented. So now I want to start another project. Still, bug fixes and minor features will be added sometime. In other words, the source will not change much, so if you use the source, you may use this version. Please check the link below for bugs and added features compared to the existing uBITX. The following features have been added to the 0.27 version. fixed bug with linux based Hamlib (raspberry pi), It was perfect for the 0.224 version, but there was a problem for the 0.25 version, On Windows, ham deluxe, wsjt-x, jt65-hf, and fldigi were successfully run. Problem with Raspberry pi -> fixed & test completed. Advanced ham band options (Tx control) for use in all countries. You can adjust it yourself. This is a video that only features added in version 0.27. also included setting up various functions using uBITX Manager from installation. 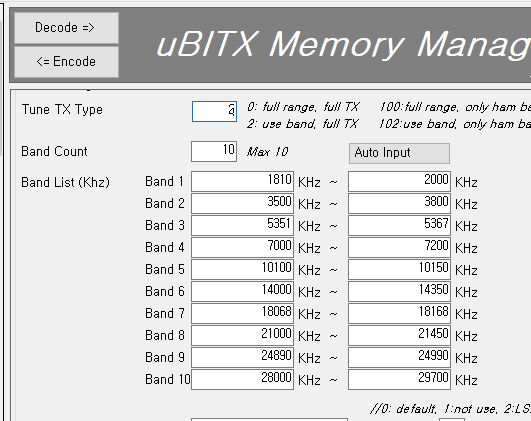 The CEC firmware for uBITX has become more and more usable with uBITX Manager. The above video and the contents of the blog can be used enough, but I will post it again as time permits. When uploading, make sure 23266 bytes uploaded appears as below. For firmware 0.27 or later, you can set the ham band as shown below. This is convenient for uBITX when you move the band. In countries that regulate the transceiver's transmit frequency, set the 'Tune TX Type' to 102. So uBITX can be used in most countries. Or in a free country such as the United States, set 'Tune TX Type' to 2. It is only a convenient band movement using the ham band. TIP : Select 'Band Select?' When you press and hold the function key, Band Selectin mode is released or toggle. You do not have to use uBITX Manager after installing the firmware. After installing the firmware, select 'Band Select?' Please press the function button on the menu. Even though uBITX Manager has not yet entered the band information, the band will move according to the band information of regeion 1 by default. 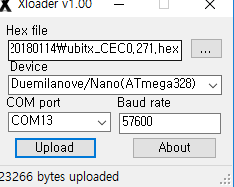 Firmware is basically implemented without using uBITX Manager even if firmware is uploaded. All of these contents are available in the above video. I received uBITX a month ago and found that many features are required, and began coding with the idea of implementing minimal functionality as a general hf transceiver rather than an experimental device. Most of the basic functions of the HF transceiver I thought were implemented. The minimum basic specification for uBITX to operate as a radio, I think it is finished. So release the 0.27 version and if I do not see the bug anymore, I will try to change the version name to 1.0. Now uBITX is an HF radio and will be able to join you in your happy hams life. Based on this source, you can use it by adding functions. I am going to do a new project based on this source, linking with WSPR, WSJT-X and so on. Of course, this repository is still running. If you have any bugs or ideas, please feel free to email me. The 4Line LCD is perfectly made by VK3DAN. It seems to be merging the source now. I am preparing firmware with hardware modifications. We are waiting for uBITX, which we ordered, to come. When uBITX is ordered, I will try various experiments. I have been using firmware .027 for a week now on my uBITX with good results until today when I tried to calibrate the VFO frequency. When I change any value in the calibration mode the VFO goes all weird and cannot be set properly until I reload the sketch. I have tried many times and found I can only use the firmware if I don't try to calibrate it. Have you noticed this? I remember I answered in the uBITX group. My firmware will not erase the previous settings, so need to perform the calibration again. Please let me know if you have not done so yet. As I mentioned in the uBITX group, I'll give you the firmware to turn the eeprom I use to factory reset. If you use it, uBITX will be at the time of first delivery. I've installed 1.01 after using 0.35. It seems to me the keyer is slower in 1.01. If I understand correctly you have changed firmware 0.27 to 1.01. Why not 0.35 to 1.01 ? thanks for all your effort, really appreciated. I'll check for key logic at 0.35 and 1.01. Key Logic changed in version 0.3x. I changed to Logic improved by user's request. I'll check if it's the reason. And the reason it looks like 0.27 to 1.01 is just because I did not post the release information on the blog. Too frequent updates could be confusing to the user, so I tried to post about release information so only when there was a big change. There is a minor version up in github. I have seen your Youtube. Do not you want to try digital mode like FT8 on SOTA?